Loft clearances are a big part of our business. With so many people using lofts as a place to hide all types of old furniture, clothing or paperwork that they really no longer need but don’t want to throw away it is not surprising that at some point people want to clear out all this rubbish, and that is where we come in. 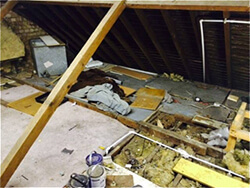 Here is an example of a loft clearance we recently undertook. Katie recently moved into her new residential house and discovered there was a secret hidden in the house. Her loft was full of rubbish left by the previous owner. Katie made a booking online with London Junk to clear her Loft. One of our truck teams arrived at Katie’s House around 09:30 in the morning. They cleared all the rubbish from the loft including broken old furniture, cardboard boxes, doors, carpets, floor boards, paint pots and timber. The client also requested us to remove all the old insulation materials as she wanted to get the loft re-insulated. By 11:30 we completed the job and were heading off to the next job. Katie was very impressed by our service and this is her feedback. “Very pleased and impressed with level of speed and service we received when we had our loft cleared by London Junk. Would highly recommend using this comfy for clearing your junk! Thank you very much” Katie, Barnet.